"The radical environmental groups ... would rather burn down the entire forest than cut a single tree," Zinke said. Interior Secretary Ryan Zinke on Tuesday in part blamed "radical environmental groups" for contributing to wildfire conditions. Zinke, in a conference call on Tuesday, said "every time there is a thinning project out, who's suing?" when he was asked about President Donald Trump’s much-derided tweets and comments about "forest management" made as the deadly Camp and Woolsey fires raged and during a visit to the state last weekend. "When lawsuit after lawsuit by, yes, the radical environmental groups that would rather burn down the entire forest than, than cut a single tree or thin the forest," Zinke told reporters. "And it's easy to find who, who is suing, and who promulgates these destructive policies." His comments came as as firefighters were making progress in battling two major wildfires in California, one of which is the deadliest in recorded state history with at least 79 dead. Trump first made comments about poor "forest management" on Twitter on Nov. 10 as the Camp Fire in Butte County in Northern California and two fires near Los Angeles raged. California firefighter's groups and scientists quickly criticized the characterization as wrong. 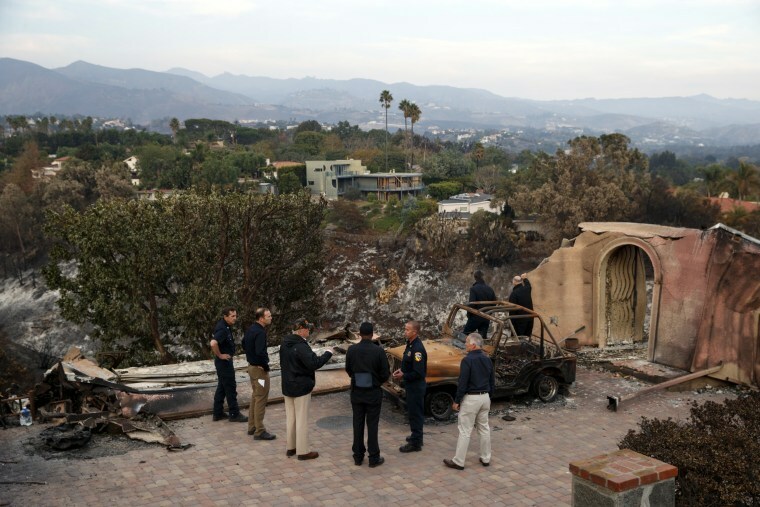 Some noted that the fires in Southern California were not in logged areas, but rather in areas full of shrubs and human-made structures. "It's not about forest management," University of Utah fire scientist Philip Dennison said last week. "These aren't forests. But after the secretary's comments on Tuesday, a spokeswoman for the Department of Interior, Heather Swift, said Zinke was speaking about the larger national issue of environmental groups suing over timber management and prescribed burn projects — not necessarily the two fires currently burning in the West. She said "that is not a California-only problem, we have seen this over and over again across the West," and highlighted objections to timber sales in Oregon. Zinke has cast blame on environmental groups for creating fire-prone conditions before. He did so in August, and there was substantial blowback from environmental groups, one of which said the interior secretary lacked knowledge of "basic fire science." Zinke said in Tuesday's call that "I don’t want to finger point," and "there's a lot of variables in this." "And yes, the season is getting longer, the temperatures are getting hotter, we've had a drought condition and historic drought condition in California," Zinke said. "The dead and dying trees from beetle kills, the density of trees, the amount of underbrush. And, and those things can be mitigated, but we have to work together." The questions on Tuesday were following up on comments Zinke made about environmental groups in an interview with Breitbart on Sunday, in which he talked about a recent visit to the California fire zones. "It's not time for finger pointing. We know the problem, it's been years of neglect, and in many cases it's been these radical environmentalists that want nature to take its course," Zinke said on the Breitbart radio program. The Sierra Club, one of the nation’s largest and oldest environmental organizations, said in a statement on Monday that Zinke was seeking to blame environmental groups for the devastating Camp and Woolsey fires, and said the interior secretary "still doesn't understand wildfires."